The Metro series is going hiking. Where once it hid in the Moscow underground, fighting mutants and scrapping with gangs for bullets, now it's travelling eastward across Siberian tundra. Over four seasons you guide Artyom through a linear story on a mission to find a new home that isn't completely radioactive. So far I've shot monsters in some icy swamplands near the Volga and fled an abnormally large bear in dark forests further east. It's going to be quite the gap year. The Metro series is defined by meticulously detailed, claustrophobic tunnels and shonky hacked-together weapons. Exodus will feature sections like this, but some of its areas are huge, and others—like the forest—are wide corridors full of loot and weapon attachments to discover. The new environments provide a way for 4A Games to test itself, but there's also a sense that players increasingly expect open, explorable environments, so the Metro series has scaled up to adapt. 4A started with the environments and figured out which enemies, animals and structures ought to exist there. 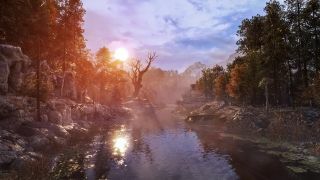 Even though the shooter will spend a lot more time outdoors, the developers want Exodus to retain the series‘ distinct tone, which means a hyper-attentive level of detail. “You come across a house and it's not just like 'oh a house that a level designer put here. '” Says executive producer John Bloch. “No, it's a house, and this person lived here or lives here now, this person died here in this way, they were doing this before they got killed or whatever it was. I get get a sense of that quickly from the first half of the playable demo, set in a run down old summer school. There’s met (killed) a host of bandits wrapped in rags and bone armour. As I fought through the area with a meticulously detailed crossbow, I learned that these goons used to be kids at the camp, sheltered by their teacher when the bombs fell. In the icy Volga zone and this forest, there is always some plot development happening in the background. Metro doesn’t want you to play it like Doom—you’ll run out of ammo quickly if you try. You are there to soak up the atmosphere and eavesdrop on the chatty AI. Stealth is important too in a world of scarce resources, and while you’re skulking around you're likely to pick up more environmental detail. I learn that the so-called Children of the Forest are divided into subgroups with different views of their teacher’s lessons. Some want to live a peaceful, isolated lifestyle, others want to go looting. I occasionally get the chance to talk to them and make a binary moral decision. I knock out the men who surrender, and spare the life of a guy I surprise while he’s fishing. Metro looks like a flashy shooter, but sometimes you get more out of it with your gun holstered. Bloch confirms that the game will be tracking your moral decisions. In the other Metro games that meant multiple endings, but Bloch is coy about whether that will be the case for Exodus. I end up fighting my way through a town of wooden treehouses into a very different second section set in a dark forest full of rampaging mutant wolves and the massive bear. It’s a good change of pace, even if the bear proves to be a gimmick for the area that turns up in the odd cutscene and an inevitable boss encounter. Away from the crumbled ruins of the camp Exodus inevitable loses some of that Metro feel, which I have so far associated with crumbling structures in urban Russia. It’s still a tense section, and while the shooting is fine, the forest is again more of a mood piece than a dynamic FPS challenge. That’s not to say the enemies aren’t smart—the humans in particular show a lot more environmental awareness than the first two games—but I spent most of my time crouch-walking quietly through the undergrowth. As with the Volga section I played earlier this year, there is still tension between Exodus’ determination to be a survival game and its history as a corridor shooter. In previous games stealth was always an option and bullets used to form the basis of the Metro economy, but you always had ammo for at least one of your weapons when a fight broke out. In Exodus the bullet economy has been replaced with a crafting system that lets you mould scrap into ammunition. I like the way this forces me to explore and stumble into clever traps set by the developers, but I expect it will set a frustrating pace if you love to charge into an encounter and blow everything up. I can’t wait to go sightseeing in this world, though. The zones 4A has shown so far have been beautiful and varied, and remarkably atmospheric. I don’t mind the idea of crawling through it on my belly, finding every weapon attachment and listening in on AI survivors. In a field that contains endlessly similar Far Cry games, good Wolfenstain games, and sweet Doom reboots, Metro has again found its niche. Plus there are still going to be underground sections, and I suspect these will end up being the best, most terrifying bits. Metro: Exodus is due out on February 22, 2019.